4mm (long) x 2mm (wide) wiener-shaped beads with the hole running through the width – imagine an actual wiener with a toothpick in it. Unlike a wiener, however, the beads are thinner at the center. 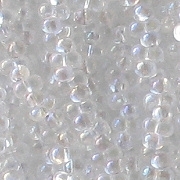 Clear beads with a silvery AB (aurora borealis) coating on part of each bead. 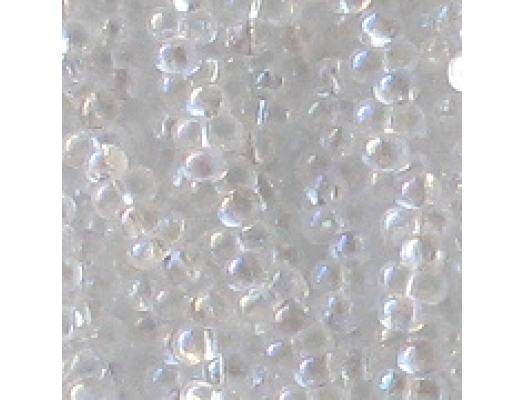 The beads appear to be in good shape, although an occasional bead may be malformed. My picture is really poor. I probably should have photographed these beads on a dark background. 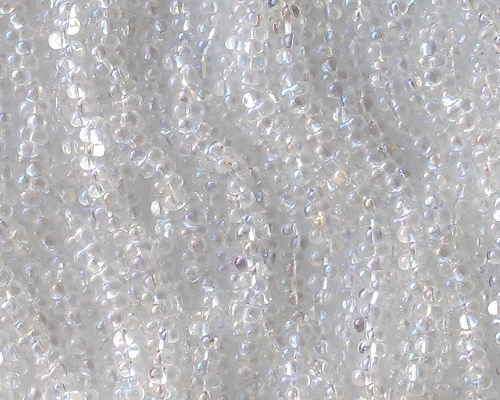 To get an idea of the shape, look at the other farfalle beads on the Small Beads page. The AB coating is fairly light. They look like clear beads with a hint of color. My supplier claims that these are very popular beads, so I got them in a bunch of colors. They are as small as seed beads. I think there are supposed to be 300 beads on each strand. I counted a strand and came up with a bit more than 290. A customer of mine says she can buy these for $1.50 per strand on another site. I can't sell them that cheaply, although if you buy $100 worth of beads, you'll get 10% off plus free shipping, which brings the price down to about $2.10. If you can find that other site, more power to you. These beads are called, alternately, farfalle or butterfly or bowtie beads, although really they look like small hot dogs. I guess that "hot dog" and "wiener" are not very appealing terms.